What machine is it on? Telling me it is a 54C will not solve the problem. Serial number or hood decals will tell me. Gt235 tractor with a 54 inch deck, I am down to a tension spring on the idler pulley. That spring is best hooked last. A short length (about 2') of small diameter, sturdy rope will aid in this. You can double the rope into a loop, put loop into hook of spring, grab both ends to extend, seat spring in deck shell, release one of the ends and ease the rope out by pulling the other end. A 445 uses a driveshaft-driven deck. 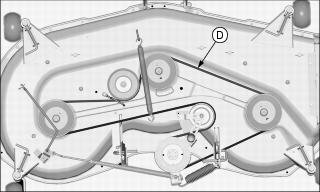 When installing the belt, it will be necessary to remove the gearbox. Diagram is below. Keep adding to this thread rather than starting a new one. Your machine came with two brands of engines, B&S and Kawasaki. Since the 48" and 54" are virtually identical, one picture came form one and the other from the other. They show slightly different perspectives. This is just an FYI. I have a 54" deck on a 345 Deere. 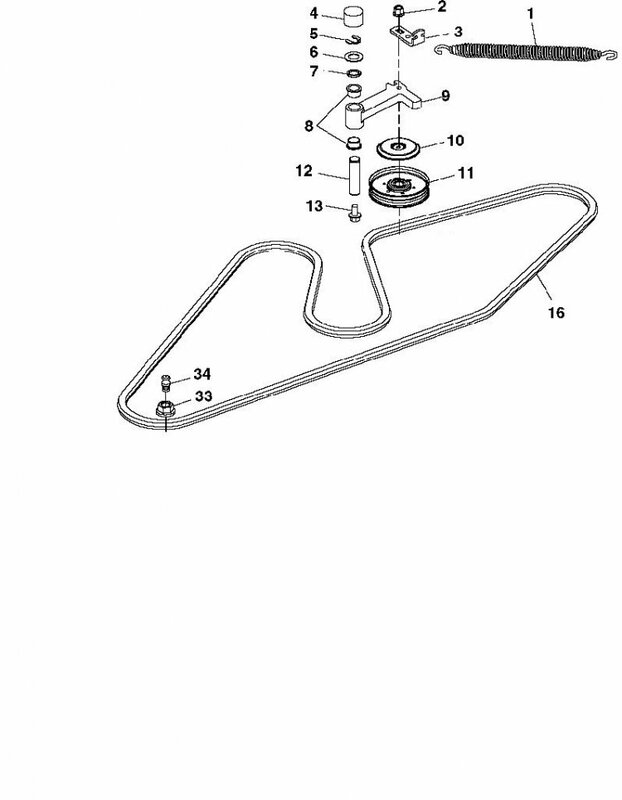 If you are looking at the deck from the rear toward the front, there is a idler pulleyat about the 11:00 position. It is the left pulley at front of the deck. The carriage bolt is prone to rotting and weakening and or cracking the deck. If you romove the carriage bolt and replace it with a grade 8 bolt you can put 2 fender washers on the underside of the deck and use a nylock locking nut on the top. This will strengthen the surface area around the bolt and prevent the deck from weakening or cracking. Garden/ lawn tractor. Thank you. There is only one routing on all three of those shaft -drive decks. Please take note that the top one is marked Front and the bottom one is from the other angle meaning the front is at the bottom. I need the part #11 - belt tension pulley maybe? Anyone know the part number for that? 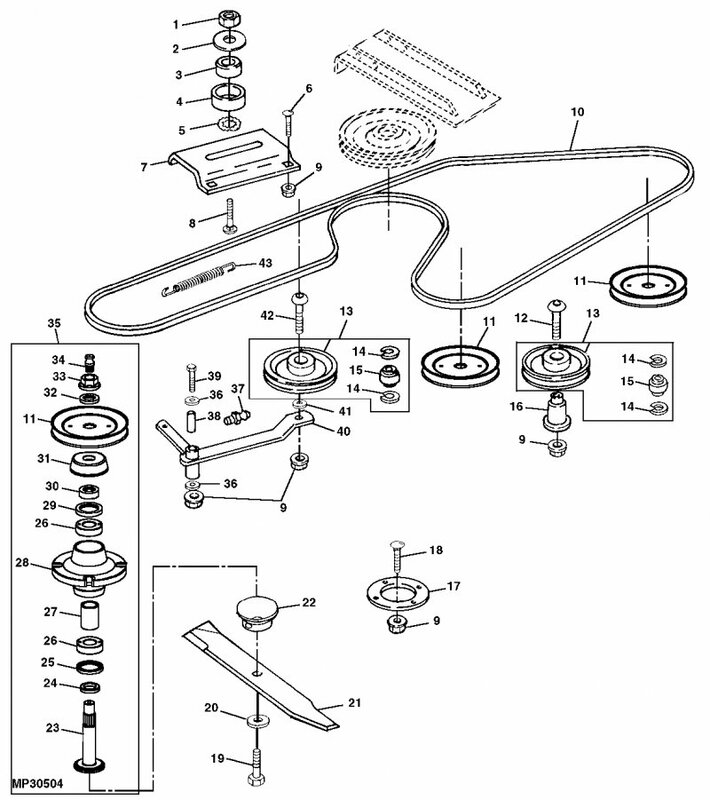 John deere L110 deck belt diagram Anyone know where I can view The belt diagram for this riding mower? ?